Happy 2014 to all! Hope everyone’s New Year’s resolution was to buy more awesome comics. 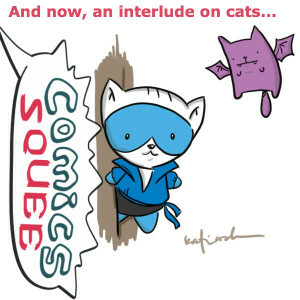 You’re listening to Issue 6 of Comics Squee, our first podcast of the new year. Each podcast our panelists, bitten by radioactive bookworms, squee about the comic books, graphic novels, and general sequential art geekery that excites them. We worried that this gave us a power set that made us the enemy of the written word library. But decided that, since Spider-Man doesn’t eat by injecting venom into living critters to feed on their goo-ified innards, we could put a more positive spin on bookworm-based powers. And then we wisely moved on. April wasn’t able to join us this issue, so filling in for her is handy comic book lover, and friend of the podcast, Robin Macias. Taking the revolving 4th chair this issue is our guest, comics artist and writer, Katie Cook, creator of the webcomic Gronk: a monster’s story. Among her other, multi-tudin-ous, credits are: sketch card work for Topps and Upperdeck; a Fraggle Rock comic; a Star Wars book for Scholastic; variant covers for titles like Fantastic Four, Helheim, Pretty Deadly, and more. PLUS, Katie’s Chriss’ favorite writer for the My Little Pony comics. 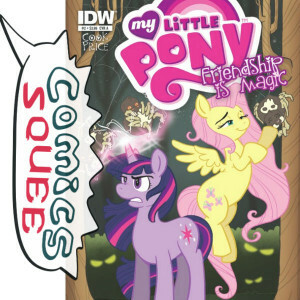 This issue of Comics Squee we’ve got: my favorite comics news site ; a surreal classic from 1993 ; a hilarious and intelligent webcomic ; and…PONIES! Regular squeester April Taie was unable to join us for this issue. 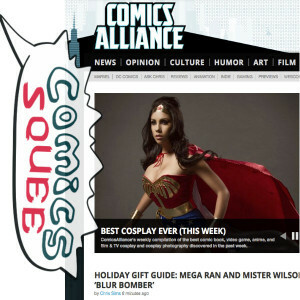 So filling in for her is Robin Macias, handy comic lover and friend of the podcast. We’re bitten by radioactive bookworms in this issue’s opening. John won the die roll to see who would go first. While looking for her own pair of D6, Katie assured us that her dice aren’t in a Crown Royal bag; once you graduate to being an adult you can go buy yourself a nice velvet bag without a logo on it. 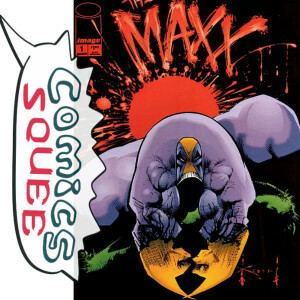 This surreal classic from the 1990s recently resurfaced in John’s attention due to its re-release as The Maxx: Maximized in November of 2013. The re-release is a touched-up version of the original comic book that was turned into a motion cartoon for MTV’s Oddities segment back in the day. John loved it so much that he taped the episodes off TV and watched the tape until it broke. The reason John really loves The Maxx so much is that it is SO screwed up, and he has a taste for things that are mentally not so nice and intense. The Maxx is about a homeless guy who’s a superhero, but also is the protector of the Leopard Queen in a weird Pangea-like dreamworld. And all the characters in this surreal comic have a parallel in both the real(?) and dream(?) worlds. Chriss didn’t watch MTV but did read the comic. She was introduced to The Maxx at a San Diego Comic Con when she got an ashcan of it for free. She’d reached a point in her comics reader evolution when she was loosing interest in superhero comics because they’re the same thing over and over. And here was something different and interesting. Honestly, most of this issue of the podcast was a MLP love fest. We discussed how My Little Pony: Friendship is Magic doesn’t talk down to it’s audience. That it isn’t worried about offending people and how that allows it to have a wider appeal than it’s target demographic. There’s the lesson there for kids, but an underlying touch for the parents to enjoy. Robin, who works as a manny, talked about how one of the Moms he regularly meets at the park brought an issue of the My Little Pony comic to the park and asked him to read it to the kids. He was reading the story to them about the Mane Six overcoming a bad guy after getting over their gloom and all pulling together to defeat the big bad. The kids were loving it, of course, but Robin suddenly realized that it had a deeper, inspiring message about dealing with depression. All in a story about ponies. We also talked about ‘head cannons’, the stories that fans write in their heads about the characters. And how angry people get when writers like Katie create stories that ‘violate’ their head cannon. Katie told the story about such a person emailing her their fan fiction with the note “educate yourself”. As to the crucial question of everyone’s favorite ponies… Robin had a hard time choosing between Fluttershy and Apple Jack, but settled on Fluttershy. Both Chriss and Katie are Twilight Sparkle fans. John eschewed selecting one of the Mane Six entirely to declare Luna, Princess of the Night and mistress of nightmares, his favorite. We also discussed: our favorite ‘background’ characters, Luna’s new pet, Katie’s editor, Big Mac’s quest for a nail, the place of alcohol in the creative process, and more. There’s a regular feature called Ask Chris, who has strong opinions and phrases things very interestingly and very well. Many of his ComicsAlliance articles have convinced our Chriss to check out things like My Little Pony: Friendship is Magic and Walter Simonson’s Thor run (see issue #004 of the podcast). There’s several articles every day that go up over the coarse of a day. And you get the full spectrum from light entertainment to heavy, wordy discussions. So it satisfies the need Chriss has to be informed, be entertained, and have new things. John’s also a fan of the site, who visits it everyday for the Best Of articles. They’re cute, have you noticed? The obsession with making pictures of them wearing cloths and in silly poses dates back at least to the Victorians. Katie declares that there are not enough cats on the internet and we discusses her own feline residents and cat works. Because it’s not a podcast without cats. Isn’t that right, fuzzy overlords? 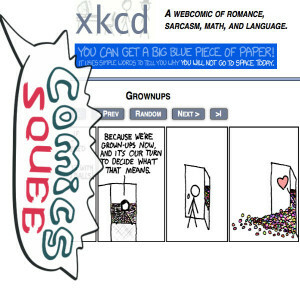 Back on topic, we discuss the intelligent humor webcomic XKCD (XKCD.com). This is, “A webcomic of romance, sarcasm, math, and language.” Robin loves it because if he gets the joke, he feels intelligent. And if he doesn’t get the joke, he looks up the subject and so learns something and feels smart. We’re back to that appeal of works that don’t talk down to their audience, which was a theme of our discussion about My Little Pony. This comic is just stick figures, so you concentrate on what’s being said and how it’s being said. And it covers topics from culture to science. It’s very entertaining and informative, and Robin loves that it gets him to Google things and learn more. Question Time: What’s Your Favorite Comic from the 1980s? Star Blazers. It’s pre-80s and one of the early cartoons that were brought over from Japan and converted for an American audience. It holds up really well some 30 years later. A giant sunk battleship from WWII, the Yamamoto, gets turned into a starship and they go off on a quest to get the MacGuffin that will save the Earth. Thundercats. Robin was going to say the same. Chriss’ favorite characters were Wily Kat and Wily Kit. Robin’s favorite was Cheetara, with the ninja action and the zoom powers. He had whole head cannon he wrote in his backyard about her. Rainbow Brite. Katie can’t think of anything she looked forward to watching more when she was a kid. Order of the Stick. Next webcomic releases, next volume. Next anything. It’s self aware stick figures on D&D adventures. The graphic novel collecting Alpha and Omega, the conclusion to Lock & Key. He’s excited to finally get the end of that saga. As was Katie. The next issue of Drumhellar, an urban fantasy that’s a little Dresden Files but way more laid back and surreal. The motivation for the first arc is that a peacock gave him a Significant Look.